The official & semi-official art gallery has always been the most important aspect of History of Hyrule. It's the reason I started the site in 2002 and it is what I want to continue to focus on. 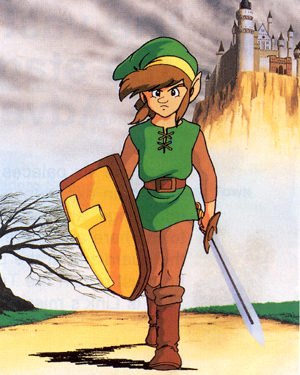 I am personally determined to find every piece of Zelda game art in existence! Well, ...I can try. The truth is though... it's no longer rare for Zelda sites to have decent galleries. So, when I started building the site again, I chose to focus on what I had that was the most unique: the publications. Since it took longer to work through the publication content than I had anticipated, I became antsy to open the site. I decided that I had to get it open before the end of 2011. As a result, I figured I would get that large chunk done and then cut completing all of the other sections until after it opened. So, I am working on the official art gallery: it will just be slow going because I'll have other webmaster responsibilities now that the site is public. Please refrain from thinking I need art sent to me unless I specifically ask for a piece.